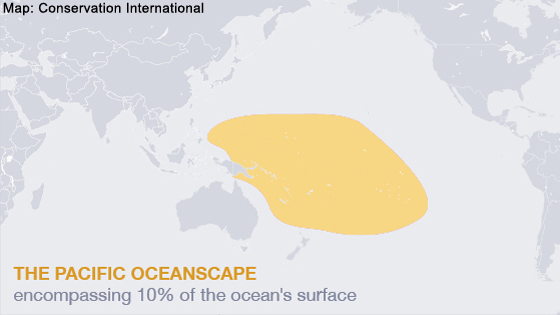 Probably one of the most encouraging developments in ocean conservation of the past several years has been the formation of the Pacific Oceanscape - a plan to establish the planet's largest network of marine protected areas in the South Pacific. Another piece of the Pacific Oceanscape puzzle is falling into place with the Cook Islands MPA that will be, for the moment, the world's largest at more than 600,000 square miles. "It is a major contribution to the well-being of humanity," stated Cook Islands Prime Minister Henry Puna stated. "This is the Pacific challenge we face. Do we take this challenge on with a name and identity that makes us small and not linked with the ocean in our own eyes and the eyes of the world? Or do we stand together with renewed pride and commitment as the world's largest ocean-island states?" This is the result of ongoing efforts by the Pacific Forum, a co-operative between 16 Pacific island nations and supported by international conservation organizations, most notably Conservation International. 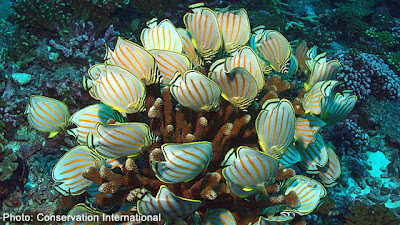 Starting with the Phoenix Islands marine protected area, in which Dr. Greg Stone, Conservation International's Chief Scientist of the Oceans worked closely with the Kirabati government that oversees the Phoenix Islands, the Pacific Forum has further plans beyond the Cook Islands MPA. Forum member New Caledonia is planning a marine protected area of some 870,000 square miles. Ultimately, the Pacific Oceanscape plan is to include a total surface area of protected ocean reaching 25 million square miles, roughly 10% of the entire planet's oceans. "We believe, in fact, I know, that this is the largest multinational conservation initiative in history," said Peter Seligmann, co-founder and CEO of Conservation International. "This is the largest number of nations and the largest area geographically."